Floating turbidity barriers (a.k.a. silt curtains, silt boom, sediment curtain) are a temporary in-water sediment barrier consisting of a continuous geotextile fabric curtain suspended from a flotation device on the water surface and held in a vertical position by ballast weight at the bottom. To provide erosion and sediment control from an up-slope land disturbance, or within a body of water during marine construction projects, thereby preventing anything from floating down stream and affecting marine life. Erosion and sediment control practice applies whenever construction activities in tidal or non-tidal bodies of water leads to unavoidable silt and sediment movement. Marine construction typically causes soil erosion into a body of water, which leads to more suspended particles. Depending on the current or wave action, this suspended sediment can travel small or large distances and affect water turbidity and marine life, including fish feeding behavior. For example, salmon need clear water to see their prey, such as aquatic insects, yet many of these prey feed on suspended organic particles that cloud the water. The purpose of a turbidity curtain, then, is to deflect and contain sediment within the immediate construction area. During the planning phase, one of the key factors in designing the correct turbidity barrier is water flow conditions. This guide pertains mostly to minimal or moderate flow conditions, such as 5 feet per second (approximately 3 knots current). It is recommended to consult Enviro-USA for situations with water flow exceeding 5 feet per second. Another critical element is the water direction. Because turbidity barriers are not dams and not designed to stop water flow, but instead designed to trap sediment, they should rarely be installed across channel flows. Whenever a turbidity barrier is to be used in moving water conditions such as a river, shoreline or offshore, special attention must be given to allow the volume of water contained within the barrier to fluctuate. Because the containment system includes land and/or water anchors, it is important to take into account tides and/or rising water situations in order to ensure the floating barrier does not submerge. Also a permeable skirt should be used if the curtain is to remain in roughly the same location. The permeable woven filter fabric allows the water to pass through the curtain and keep sediment confined to the work area. Water flow and sediment particle size should therefore be taken into consideration when designing a turbidity barrier. Removal of soil particles is an option but should be considered only if the process does not create re-suspension of particles and/or if Authorities require it. When the project is complete and the turbidity barrier needs to be removed, soil particles should be allowed to settle for at least 12-24 hours prior to the removal of the equipment. Type I (or type 1 as referred to by some States) are considered light duty and should be used in protected areas where there is no current and the area is sheltered from wind and waves. 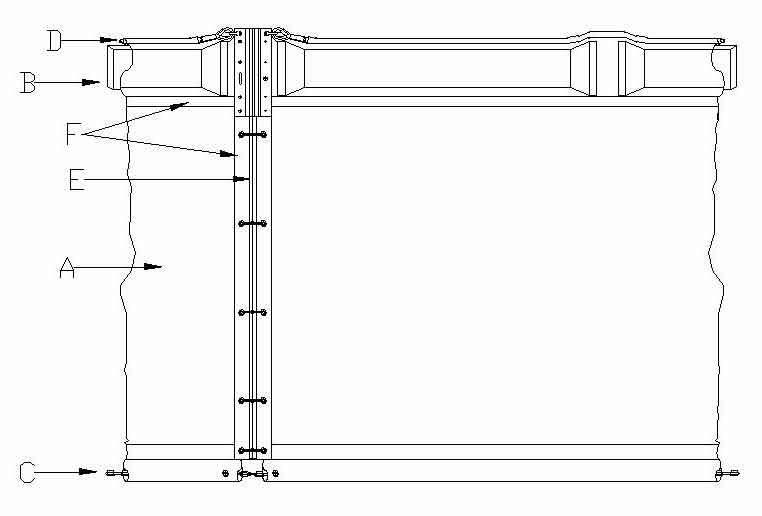 Type II (type 2) are medium duty barriers that should be used in areas with small or moderate current (up to 2 knots or 3.5 feet per second) and/or wind and wave action can affect the curtain. Type III (type 3) are heavy duty curtains that should be used in areas where considerate current (up to 3 knots or 5 feet per second) is present and/or tidal wave action and wind can affect the floating barrier. 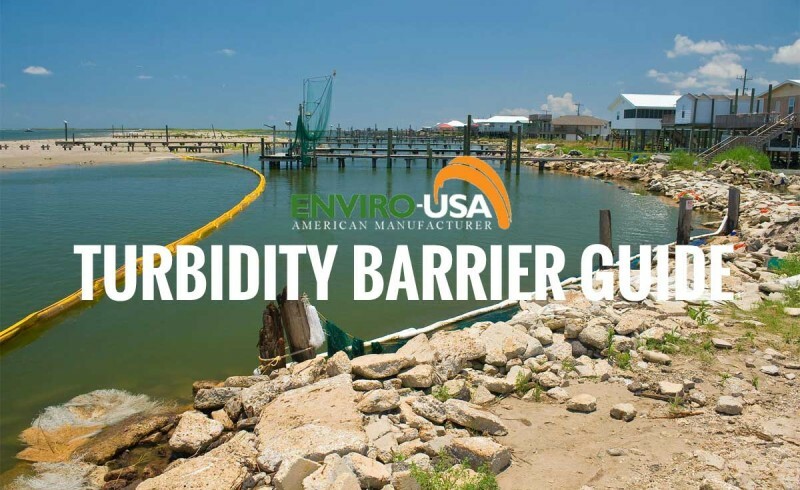 In situations where the construction area is not subject to tidal action and/or significant wind and wave forces, the turbidity barrier should extend the entire depth of the body of water. However in tidal and/or wind or wave action situations, the curtain should never extend to the bottom. Instead a minimum of 1 foot between the skirt and the bottom should exist so that the movement of the skirt generated by tidal back and forth motion does not fan or stir sediments. In deep water, the skirt height is usually no more than 10-12 feet. A longer draft increases the load and strain on the mooring system and can also increase the chances of the curtain to billow up towards the surface under the pressure of the moving water. The potential effect is an effective depth which is significantly less than the skirt depth, which would reduce the curtain’s effectiveness. 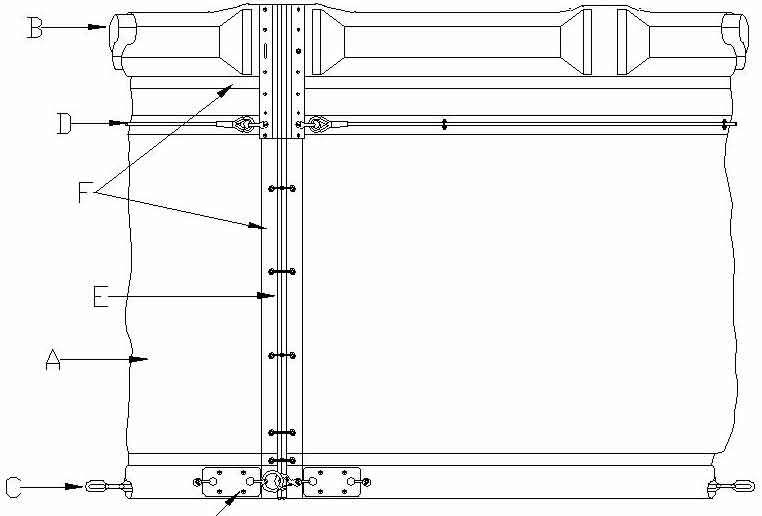 When sizing the length of the barrier, it is recommended to add 10-20% to allow for measuring errors, facilitate installation and reduce the stress from potential wave and/or current action. Turbidity barrier sections can be connected together but it is good practice to the minimize the number of joints. 50 foot sections are the industry minimum benchmark but sections usually never go beyond 100′ sections for stability considerations. Enviro-USA’s floating turbidity curtains are available as permeable or non-permeable skirt, in 50 & 100 ft sections or any custom length up to 100’. The integrity of a turbidity barrier largely depends on the ends being secured firmly to land and/or water. Both the floating ends and weighted lower ends must extend well into the shoreline so that the work area where sediment may enter the water is fully enclosed. Trees and other large solid objects can be used to attach the ends of the curtain. For situations with still water and little or no flow into the containment area, the fabric can be impermeable, creating a containment barrier. However, silt curtains are not designed as water impoundment dams and should not be expected to stop the flow of a significant amount of water. In general the purpose is to isolate the immediate work area and allow sediment to settle out of suspension. That is why a permeable skirt is typically used. 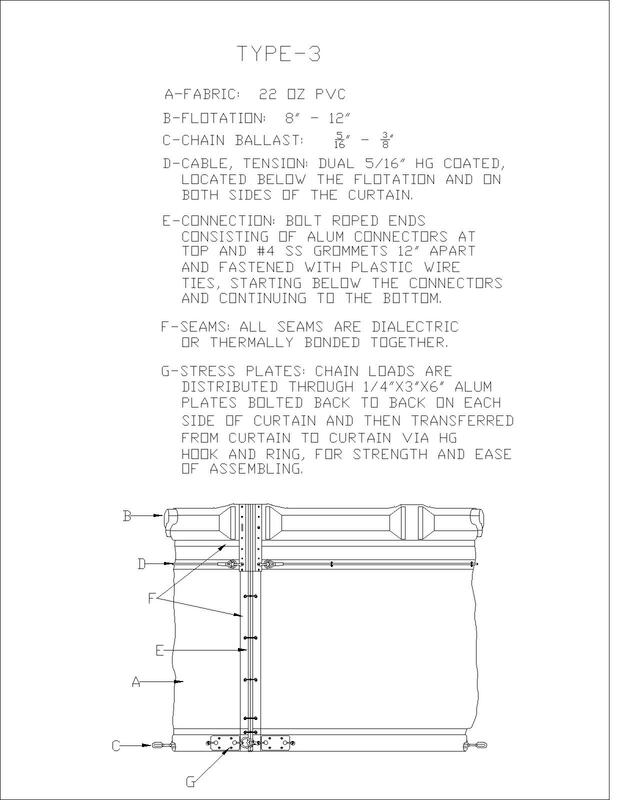 Follow manufacturer’s recommendations to determine the permeability properties of the curtain. Color: Barriers should be a bright color such as yellow or orange to draw attention of boaters. Curtain Skirt Fabric: Must meet the minimum requirements in terms of thickness, weight, tensile strength and UV inhibitor. See table 1. 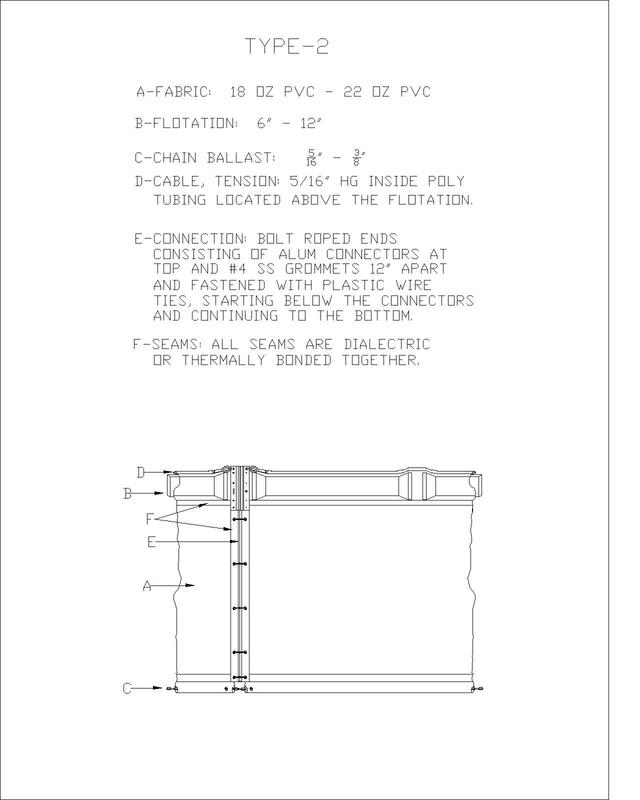 Seams: All seams are thermally welded or sewn. Floats: Flotation devices shall be flexible, buoyant units contained in an individual flotation sleeve or collar attached to the curtain. Buoyancy provided by the flotation units must be sufficient to support the weight of the curtain and maintain a freeboard of at least 3 inches above the water surface level. Load lines: Must be fabricated into the bottom of all floating turbidity barriers. Type II and III must have load lines also fabricated into the top of the fabric. The top load line shall consist of vinyl-sheathed steel cable and shall have a break strength in excess of 10,000 pounds. The bottom load line shall consist of a chain incorporated into the bottom hem of the barrier of sufficient weight to serve as ballast to hold the curtain in a vertical position. Additional anchorage shall be provided as necessary. The load lines shall have suitable connecting devices which develop the full breaking strength for connecting to load lines in adjacent sections. Land anchors usually consist of a marine grade universal connector, some poly rope and a 15” or 30” ground auger anchor. Typically type 1 applications require only land anchors. Water anchors include an anchor, a leader chain, some nylon rope, a heavy duty marker buoy and 6 feet of painted line. 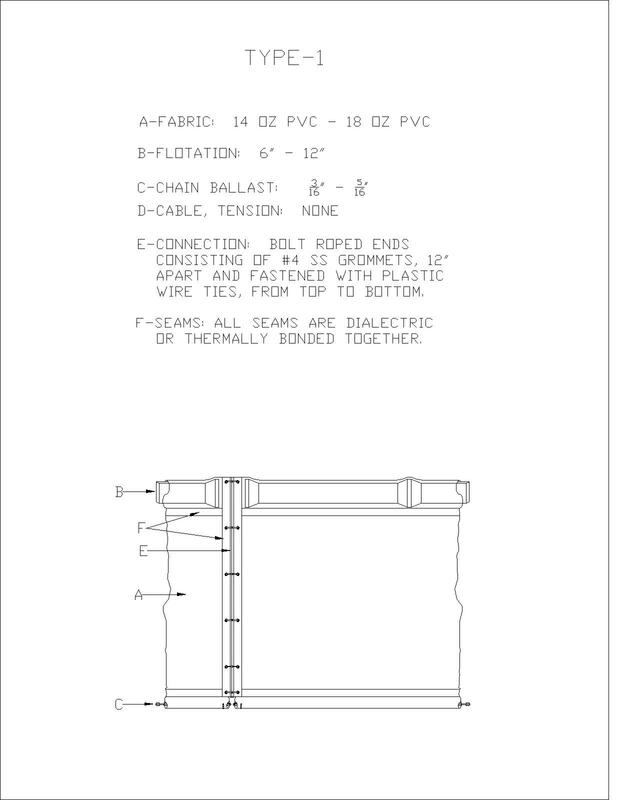 Typically, water anchors are a requirement for any type 2 or type 3 moving water silt curtain. The anchor itself can be grappling hook, plow or fluke-type and digs into the bottom. The nylon rope acts as anchor line between the anchor and the buoy. When used with Type 3 applications, the anchor lines must have enough slack to allow the barrier to float freely with tidal changes without pulling the curtain down. Grab Tensile Strength, lbs. 300 for 18 oz. and 500 for 22 oz. Calm water applications typically require a Type 1 installation. First the curtain end stakes and anchors are set. Then, the turbidity barrier is towed in the furled condition and attached to the stakes and anchor points. Once it is determined the floating barrier is securely attached, the furling lines can be cut to unfurl the skirt and let it drop. Moving water applications will require a Type 2 or Type 3 installation. The first step is to set all the anchors (including anchor buoys) and pay special attention to the holding power of these anchors to retain the barrier under the actual current or tidal conditions. In addition tidal applications require anchors to be installed on both sides of the curtain to resist to currents in both directions. Then, the furled curtain can be put in the water. 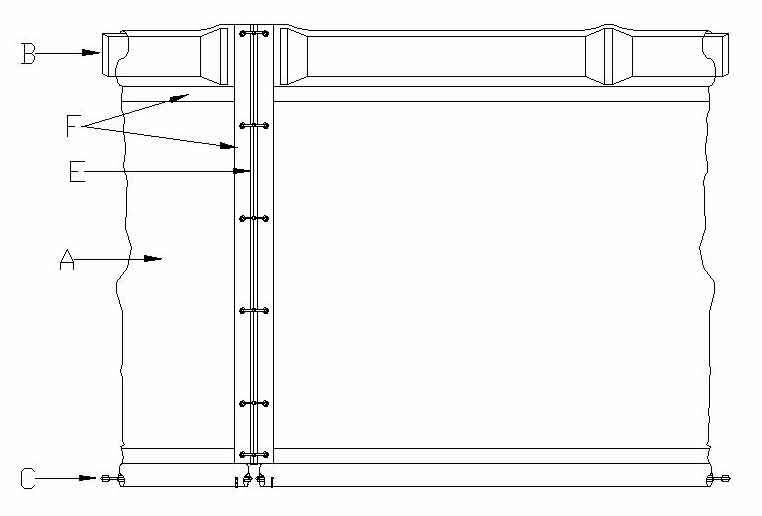 After the anchors are in position and secure can the furled curtain be towed and secured to the upstream anchor point, then sequentially attached to each next downstream anchor point until the entire curtain is in position. If the position, buoyancy and anchors are satisfactory, then the furling lines can be cut so that the skirt drops. When water anchors are used, always attach them to the flotation device and never to the bottom of the curtain skirt as it could damage the curtain. See figure 1 for typical installation drawing. Maintaining the curtain will ensure the continuous protection of the watercourse. 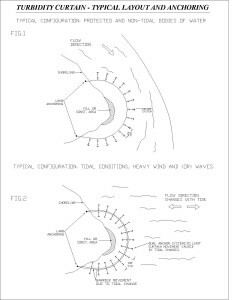 The turbidity curtain shall be inspected daily, with additional monitoring of performance during storms or increased flow and/or wind events. Any visible plume of cloudy water passing beyond the curtain from the enclosed construction area shall constitute inadequate performance of the turbidity curtain. The Contractor shall immediately modify, adjust, or repair any portion of the turbidity curtain to correct inadequate performance. Consult the manufacturer if necessary as repair kits are available. 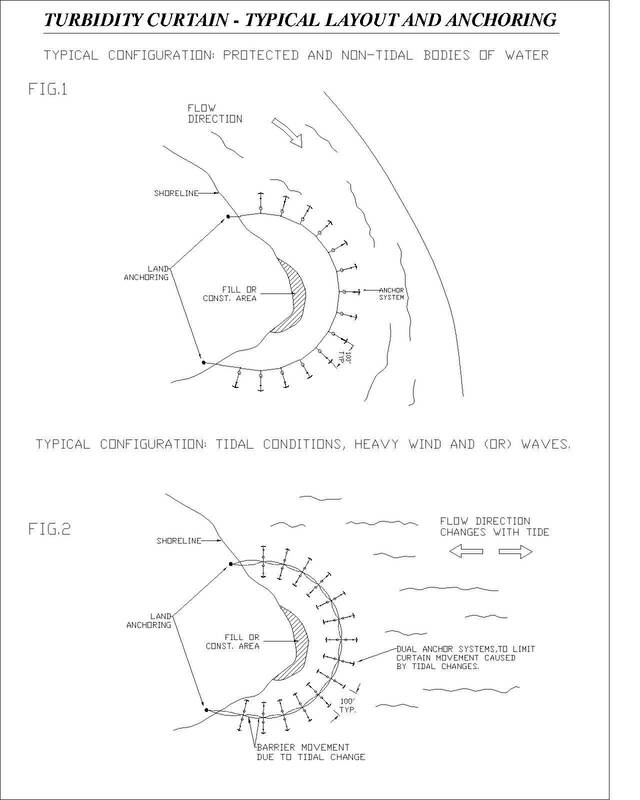 The turbidity curtain shall remain in place until the protected construction activities are complete and the turbidity of the water enclosed is reduced to acceptable levels. The turbidity curtain shall be removed in such a way as to minimize release of sediment. Sediment behind the curtain shall be removed before removal of the curtain, if directed by the Engineer or the Authorities. If so, any resulting turbidity shall be allowed to settle before removal proceeds. The site selected to bring the curtain ashore should be free of sharp objects such as rocks, construction materials, cement, etc in order to minimize the risk of damage when pulling it out of the water and hauling over the area. Whenever a curtain has a deep skirt, it is recommended to furl before removing the equipment from the water. The curtain shall be removed within 72 hours of the water turbidity being reduced to acceptable levels. Please feel free to contact Enviro-USA American Manufacturer LLC to ask any questions about floating turbidity curtains. We will be happy to answer any questions or provide D.O.T specifications information for your State.